Artist Sebastian Errazuriz came up with an interesting idea for a bookshelf. Seen on Designboom, ‘Metamorphosis’ is a hand carved furniture piece, made from baltic birch plywood and resembles a giant tree branch with many ramifications. 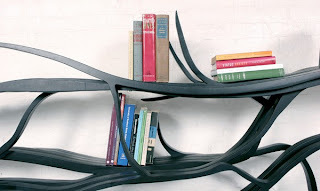 Suited for books and magazines, the unusual shelving unit can also be used for storing various objects; it is all up to the creativity of the owner. Sebastian Errazuriz created ‘Metamorphosis’ in order to complete the collection which will be exhibited at the Cristina Grajales Gallery in New York. The name of the event held at the gallery is called ‘Beautiful Premonitions’ and will be a chance for the designer to showcase his original works.